Botox allows to fight against fine expression wrinkle: lion’s wrinkles (between the eyebrows), crow’s feet (eyes’ corners) and forehead. Botox is equally indicated in the treatment of excessive sweating. More known by the wide public under the commercial name of Botox®, the botulinum toxin type A is a purified protein that we inject in the superficial facial muscles where wrinkles are installed. This protein blocks the release of the chemical responsible of muscle contraction. Firstly used in the treatment of strabismus and of blepharospasm (involuntary closing of the eyelids), this toxin is used since 1989 in the wrinkle treatment. Arrived in France in 2003, Botox is used in the aesthetic medicine in order to give the injected areas a more relaxed and smoother appearance like after a good night’s sleep. Nowadays, scientific journals also confirm the interest of Botox® injections in the armpits for the treatment of excessive sweating, also known as axillary hyperhidrosis. In what cases is Botox® recommended? Results: the aim of the treatment must be above all, the general harmony of shapes and the natural look of the face. The results are temporary and last from 4 to 8 months, but experience shows that over the years, the toxin’s duration of action grows longer. We then proceed to more spaced out injections. In the treatment of excessive sweating, the injection of one dose of Botox® in each armpit allows to stop it. Contrary to hyaluronic acid that is injected in the wrinkles, Botox is injected in the muscle. The intervention, almost without pain, is done in several minutes without anesthetic. The injections are done with a thin needle. For lion’s wrinkles, we make 3 to 5 injections in a V shape between the eyebrows and above the start of the eyebrows. For horizontal forehead wrinkles, we inject in 4 to 6 places, regularly situated on the forehead. If necessary, we can make an injection at the tail of the eyebrows. For crow’s feet, we make 1 to 3 injections at the outside of the eyes going down towards the cheekbones. The results last between 4 to 6 months. Their duration of action increases after several injections. They are reversible. This treatment can be associated with all the other facial techniques: chemical peels or mesolift, for example. For whom and at what age? There are no rules. For example, certain people frown from a young age, which can make them look worried. That is why they resort to this technique from the age of 25-30 years old. You need to note that the more the wrinkle is already formed, the more difficult it is to reduce it or to make it disappear. The early Botox® injection in small doses allows to abandon these facial expressions that give the impression of being tired and to avoid the dermis to break which is at the origin of wrinkles. Botox® injection can also correct from the age of 20 certain small flaws: raise the tail of an eyebrow that has the tendency to fall, open the eyes or elongate round eyes to become almond-shaped. Injected in very precise spots, it wakens the face and renders it harmonious without freezing it. According to their antigenic properties, we can distinguish several types of Clostridium botulinum. We can count 7 of them: A, B, C, D, E, F and G. The botulinum toxin (Botox®) used in aesthetic is of type A or BTX-A sold under the name of Botox® or Vistabel® by the pharmaceutical company Allergan and under the name of Dysport® by Ipsen-Biotech. Vistabel® is authorized on the market for the treatment of wrinkles and hyperhidrosis (excessive sweating). Botox® and Dysport® are the specialized products, used in different medical indications (ophthalmology, neurology, otorhinolaryngology) that have been used for the same amount of time and thus for which we have the same perspective. Azzalure®, more recent, derived of Dysport®, sold by Galderma pharmaceutical company, is recommended especially in men, mature skins and for forehead wrinkles. Finally, the last arrival, Bocouture®, developed by Merz Pharma pharmaceuticals, has the distinctive feature of being stable at room temperature. The session lasts around 20 minutes. First of all, Doctor Germain proceeds to a face analysis at rest and in a dynamic state in order to determine the muscles that need to be relaxed and in order to select the injection spots. The injections are realized with a very thin needle, also named cannula, a round tip needle that considerably reduces the risk of bruising. In order to obtain a good result, the injections are done in depth. According to the area to be treated, an anesthetic cream can be prescribed before the session. The Botox® injections allow to obtain a lifting effect of the face without having to resort to aesthetic surgery, which means no general anesthesia and no hospitalization. Botox has an almost immediate tensing effect on wrinkles and fine lines and promises rather spectacular results: a visible rejuvenation of the eyes and forehead after only one week. What are the limitations of Botox®? The doses used in aesthetic do not represent any toxic risk. Botox® does not present a long term cumulative effect, not even when you begin using it at a young age. On the other hand, if we inject Botox® too frequently (less than 3 months), over time, the body can develop antibodies that will put up resistance to the toxin rendering it less efficient. Also, in the case of an incorrect dosage, Botox® can lead to numerous complications: wrinkle or eyebrow asymmetry, frozen face, etc. The current tendency though is to use low dosages. Botox is contraindicated in patients suffering of myasthenia or of lateral amyotrophic sclerosis, in pregnant or breastfeeding women. 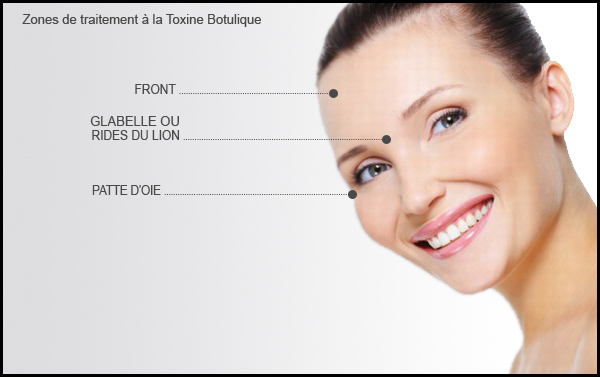 The prices of the Botox® injections vary according to the area treated and to the number of vials used. For more information please go to our prices page.